Little did I know that I am entering whole new world full of people with ideas, where the pen was mightier than sword, poems sweeter than the best fragrances, humorists that could tickle a funny bone ,or create political satires funnier than reality ! There were fashionistas, travelers who had seen some exotic places and shared their tales, painters, photographers vividly displaying their creativity and experts offering advice on what to buy! The review of books and movies are helpful in deciding what to read or watch. The journey has been very rewarding as so many people became friends in a matter of time, posting their words of encouragement constantly. Some of them were generous to give me a place on their lovely blogs to contribute. I had never seen such love elsewhere and regardless of their age, we continue to be friends. Just a few months into the blogging when a region wise blog contest was held, a group of young bloggers, Anukriti and Stephen AK, approached me to be a part of their team called, Mumbai Bloggywood. It did not matter that I hailed from Northern region but to be a part of young team bubbling with energy, always ignited the same enthusiasm to contribute to this team! A prominent blogger Zephyr, invited me to contribute to her blog’ The Cybernag’ that came as a pleasant surprise. She was very exact in terms of what she wanted me to write about and to learn from someone like her is an experience difficult to pen. Even without meeting her once, I felt she was around. Recently when I had lost my father, I got a mail from her to share the grief, which showed the humane side of the gem of a lady. It gave me the assurance that there are still people in this world who have a huge heart and are magnanimous! Like wise another blog friend, Alka Gurha from Gurgaon whom I have just met once has shown me what kindness is all about when she sent me a message as to why I had not posted on my blog for almost a month! Saru Singhal the poetess who lives in New Jersey has continued to climb the ladders of success with her lovely poetry, has a heart of gold too! I have learnt a lot from the creative writers like Purba Ray, Rachna regarding the finer nuances of blogging. I posted articles on travel to some destinations I had been, and bloggers like Ramya who works in Bangalore , and her husband became friends and approached me when planning their travel to Srilanka and Thailand! This was the first time I realized that I could be a travel guide too, a reward which remains unmatched. I got so much in return to learn about their culture and how easily she gives back to society by supporting causes that matter in helping the poor and needy children. My only regret is that I could not attend the wedding of her sister ( another blogger)in Bangalore for which she had invited me. While traveling in Srilanka I got an opportunity to meet Asamptha, a Srilankan travel and fashion blogger and her family who exchanged notes while basking on the shores of tranquil sea in Colombo. Last week I was in Singapore and was fortunate to meet another writer Jaishree Srivatsan ( Jaishvats!) who pens some very stimulating stories! I could never imagine that young Jaishree blessed with a seven year old son and a cute two year old daughter would travel all the way to have coffee with me and chat, leaving her family at home on the weekend of Chinese New Year! I laughed heartily when she mentioned that her husband wanted her to be sure before I met her, lest I turn out to be a stalker! PS- There are many more bloggers hugely talented whose names I could not mention but are instrumental in sustained support to my blog. Sir, you can be a perfect guide. I have read your posts. I have told you multiple times that you are my backup plan for any travel related tip. Blogging as you've said has changed the way I think. It has given me perspective and it came from reading these amazing people online. Thanks for the mention, Humbled! I am jealous as you have met a few bloggers and I have met only one. I agree with Saru. I even pinged you about guidance when planning a trip. This is such a lovely post and makes us all feel grateful for the beautiful bloggers who enrich our lives. Thank you for the kind mention as well. Rachna you are too kind and reading your posts makes me feel if half the families could raise children like you, we will have a perfect world! Very kind of you to mention me in this post. In fact, I'm grateful to you in more ways than one. As you say, the beauty of blogging is that it has exposed us to many wonderful friends across the world. And you met Jaish? How wonderful. That's what I keep telling everyone - the best thing about blogging is the amazing people you connect with! Thanks for the mention, Rahul. Yes, blogging is indeed a great way to make great friendships. I respect you not just as a person and blogger but also a soldier who has fought for our country and us. I loved all your posts about that experience. I do hope we can meet sometime in the not too distant future. You have been too kind in your mention about me. Thank you so much. Thanks Zephyr ! I still feel that you are like an iceberg just 1/10 visible when it comes to knowledge and there is still so much to learn from someone like you! The pleasure is mine and meeting you was a great experience! You are a perfect balance of a knowledgable and a loving mother who could spare time and share your experiences that I could never feel how time flew,Jaish! I still have many a miles to go! So nice to read this... yes I have been blessed with some wonderful friends due to blogging and have had many wonderful experiences!! I have saved some of your travel posts for reference...you write in details about the places you visit. Yes, we are knowing so many like minded bloggers through this blogworld. I too have met some and enjoyed discussing our posts with them. One more thing is, I never knew about my own opinions until I started writing them here! This is a 'different' world. You were the Sachin Tendulkar of our Team, Uncle :) And you are one of the best bloggers. You are immensely talented.. I have been in and out of blogworld for quite a long time and I now realized that I've missed so many amazing things. Glad to be back on your blog :) Thanks for mentioning! 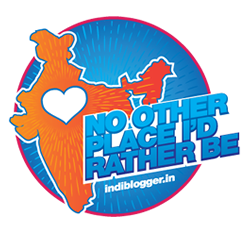 Anyways I wrote this... Rahul sir the best thing about me bloging is definitely meeting you, you were not just my travel guide, you were also best guide who helped me make best decision, learn more and sail through my tough times. I can't appreciate you enough for everything you have been. In simple words, you are awesome person. Keep blogging keep spreading happiness. This is a post we can all identify with. One of the biggest perks of blogging is making friends across the globe.